We continue our Presidential Geography series, a one-by-one examination of the peculiarities that drive the politics in all 50 states and the District of Columbia. Here, a look at North Carolina, the Tar Heel State. FiveThirtyEight spoke with Eric Heberlig, an associate professor of political science at the University of North Carolina-Charlotte, and Ferrel Guillory, a longtime writer and editor for the The News & Observer in Raleigh, N.C., and an adjunct faculty member in the Department of Public Policy at the University of North Carolina-Chapel Hill. The choice of Charlotte as the host city for the Democratic National Convention may seem unremarkable. President Obama carried North Carolina by fewer than 14,000 votes in 2008, making him the first Democrat to win the state since 1976. The Obama campaign hopes the convention will be a boon to organizing efforts and help solidify gains in its newly won territory. But the fact that North Carolina is a target at all for a Democratic presidential campaign would have been hard to contemplate just a couple of election cycles ago. There were trends that seemed to favor the Democrats — an influx of moderate, well-educated voters and a growing Hispanic population — but the payoff seemed years away. 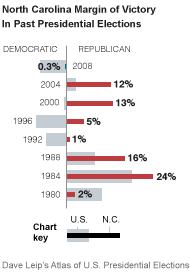 North Carolina had been reliably Republican for more than two decades. Even Bill Clinton, a Southerner who managed to carry other Southern states, fell short in North Carolina. But over the past few decades, the state’s economy has become much more diversified, remaking the state’s political landscape. Longtime economic engines in the state, like tobacco, textiles and furniture, have been fading, while newer sectors — like banking, biotechnology, pharmaceuticals and telecommunications — have been growing. New kinds of jobs have attracted new kinds of voters, and North Carolina is younger, more diverse and better educated than it used to be. But Mr. Obama’s 2008 victory in North Carolina came early. Favorable political conditions nationally and a substantial surge in turnout pulled the state into the Democratic column ahead of schedule. North Carolina, while more competitive than it used to be, is still to the right of the national tipping point, and Mitt Romney has had a slim lead in most surveys of the state conducted this year. From 1990 to 2010 the number of Hispanics in North Carolina increased almost tenfold, and the state now ranks 11th (PDF) nationally in Hispanic residents. Most of that growth has been in North Carolina’s main urban areas, like Charlotte, Raleigh, Durham and Greensboro. Indeed, North Carolina’s cities have been leading its population boom, making the state significantly more urban. The cities have seen an influx of young, well-educated voters drawn to banking jobs in Charlotte and knowledge jobs in the Raleigh-Durham-Chapel Hill area, known as the Research Triangle, Mr. Heberlig said. In addition, many African-American families have been moving back to North Carolina, Mr. Guillory said, reversing the out-migration of blacks from the state that occurred in past decades. The overall effect of these trends on the state’s racial makeup has been substantial. In 1990, North Carolina’s non-Hispanic white population was 76 percent (PDF). By 2000, it had dropped to 73 percent — and according to the Census Bureau’s estimate, it was down to 65 percent by 2011. Currently, the state is 22 percent black, 9 percent Hispanic and 2 percent Asian. 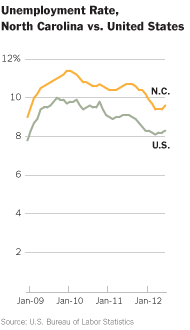 Not surprisingly, the growth of North Carolina’s cities has helped Democratic candidates. If Mr. Obama had matched John Kerry’s 2004 performance in the four counties containing Charlotte, Durham, Raleigh and Greensboro, North Carolina would have remained red in 2008. There are now enough Democratic-leaning voters in North Carolina’s metropolitan areas to power a Democratic presidential candidate to victory under favorable political conditions. Still, North Carolina’s 15 electoral votes would likely go Republican in an election fought to a draw nationally. Outside of its major cities, the state is almost exclusively conservative (save for the rural, black-majority counties in the northeast and the liberal enclave of Asheville). The mountains in the western third of the state, the rural counties along the coast and many suburbs and exurbs in the Piedmont section of the state are all heavily Republican. “Republicans are still very strong in white majority rural counties,” Mr. Guillory said. Moreover, Mr. Obama may be hindered by the state’s struggling economy. It’s unemployment rate, at 9.6 percent, is substantially higher than the national average. Wilmington’s New Hanover County, on the southeast coast, has been an almost exact barometer of the statewide vote in North Carolina for the past three presidential elections. While it is a bit less diverse than North Carolina as a whole, New Hanover County is home to well-educated voters associated with the University of North Carolina-Wilmington, and it has a fast-growing (PDF) Hispanic community. Its economy has a bit of both old and new North Carolina, revolving around tourists flocking to the beach, as well as manufacturing and cotton and tobacco farming in the rural areas, Mr. Heberlig said. One word of warning, though: New Hanover County has been slowly trending Republican, Mr. Guillory said, and its accuracy as a statewide bellwether may not hold up this year. Mr. Obama has a 38 percent chance of carrying North Carolina, according to the current FiveThirtyEight forecast. While his 2008 victory was made possible by the demographic trends in the state, it was realized by a surge in turnout that may not be repeated this year. Turnout in North Carolina jumped almost 8 percent from 2004 to 2008, the largest increase in the nation. The state also experienced among the largest increases in youth turnout. Even with all that, Mr. Obama barely carried the state. North Carolina is much closer to the nation’s electoral tipping point than it was a generation ago. The state is even closer than it was four years ago. In 2008, the state leaned to the right relative to the national popular vote by about seven percentage points. Since then, the demographic trends that have made North Carolina more competitive have continued but at a significantly slower pace because of the recession, Mr. Heberlig said. North Carolina has become about two percentage points more Democratic: the FiveThirtyEight forecast currently pegs it at about five percentage points more Republican-leaning than the national average. Put simply, North Carolina has moved toward the political center, but it’s not there yet.